Through a re-imagining of the initial sequence of the film The Wizard of Oz (1939), the fantasy world of cinema and the reality of Judy Garland’s complex life collide. Instead of taking Dorothy to Oz, the twister transports a young, hopeful Garland into the future where she encounters her disillusioned adult self. 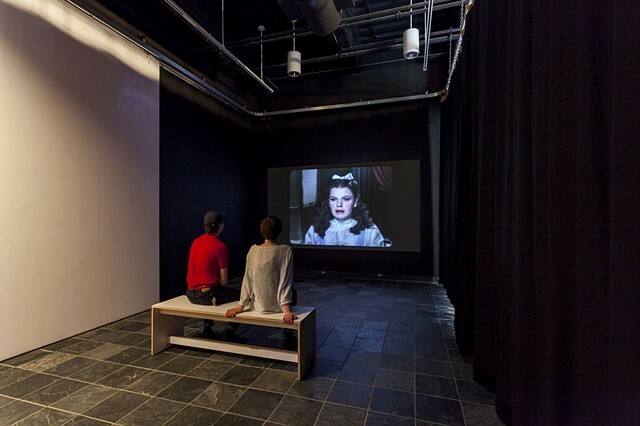 After the Rainbow is the second work in the Dark Matter series, an ongoing cycle of video installations that are concerned with personal and historical experiences of time, and how these relations are mediated by screen technologies. Begun in 2005, each work in this series takes the form of a séance fiction where encounters are staged between the past and future selves of a deceased screen star. The Dark Matter series emerged from ongoing research into cultural theories of hauntology, which also informs Soda_Jerk’s live video essay The Carousel (2011). Materials: Donnie Darko (2001), Easter Parade (1948), Judy, Frank and Dean: Once in a Lifetime (1962), The Manson Family (2003), Meet Me in St. Louis (1944), Twin Peaks: Fire Walk with Me (1992), Planet Terror (2007), Vertigo (1958), The Wizard of Oz (1939).